The Jewish community of Riga, Latvia rejoiced this week at the new Torah Scroll welcoming celebration, which took place Sunday on the spot where the city’s Great Choral Synagogue stood until July 1941, when it was burned by the Nazi soldiers with countless people trapped inside. 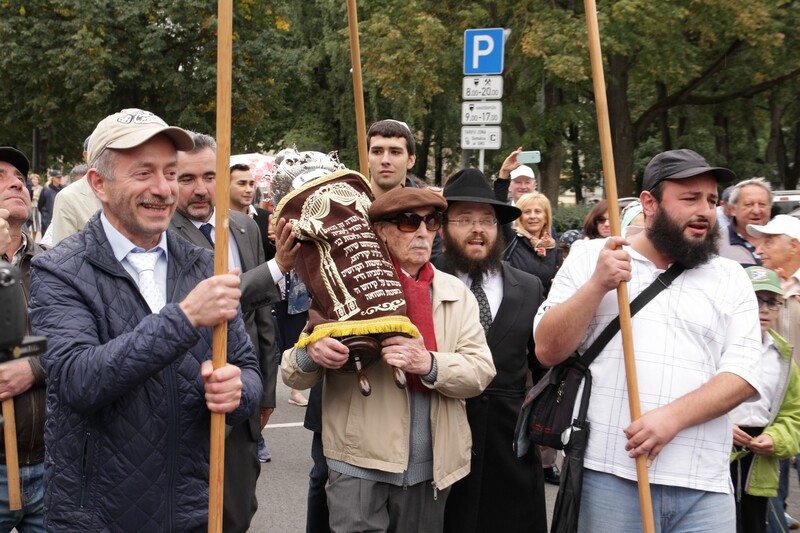 Hundreds of Riga’s Jews – community members, guests young and old, gathered there Sunday to put the finishing touches on the new Torah Scroll, written in the name of all Latvia’s Jews, and to celebrate with it the continuation of Jewish life in the region. The ceremony was opened by the chief Rabbi of Latvia Mordechai Glazman, who began by blowing the shofar and speaking of Israel’s eternal fate. “It is in this scary place that we gather today to show that the Jews continue to live and preserve the tradition and heritage of the nation of Israel!” he said, thanking all those who participated in the process. The new Torah Scroll took about a year to complete and is dedicated to the memory of all Latvia’s Jews fallen in the Holocaust. The idea was initiated by Rabbis Mordechai Glazman and Shneur Kot of Latvia and later joined by local Jews from Riga, Dvinsk, and other Latvian cities. The cantor of Tel Aviv Central synagogue R’Tzvi Grinhaim flew in especially for the occasion and led the crowd in an emotional prayer, followed by local Jewish children singing an reciting verses from the Tehilim. Over 90% of Latvian’s flourishing Jewish population perished in the Holocaust in WWII. Today’s Jewish community traces its roots to survivors, who fled to escape the Nazi invasion and later returned, and mostly to Jews newly immigrated to Latvia from the former Soviet Union. The modern Latvian Jewish community began its revival when FJC representatives came to the region after the fall of the Iron Wall and today is growing and active.